Santa is riding into town this year in his hot little red car instead of his sleigh. 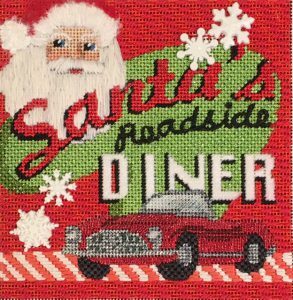 Nancy just finished stitching the second canvas in our newest exclusive club, The Christmas Diners. This piece is so stinkin’ cute! 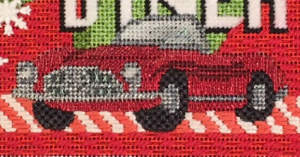 I love how she stitched the car. Honestly . . .I was a little stumped on what to do with this car other tent stitch it. The wheels look like they have tread on them. 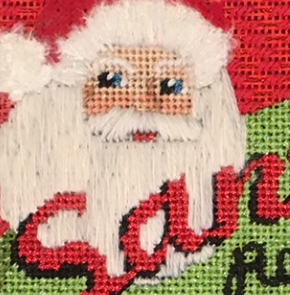 One of the most frequent questions I am asked at the shop is what stitch to do on a Santa’s beard. I always say that every beard is different on a Santa. They all have a different look. Nancy nailed it on this one! 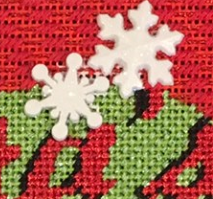 I love the snowflakes Nancy found to embellish the canvas. Those will only be offered with the club. So don’t wait to sign up! You can sign up online or by calling the shop. I hope you join in the fun!